Grandma tells her grandson Otso about how the food chain works: nature stays in balance when animals eat other animals. There’s one question that keeps bothering Otso, though: So who eats people? 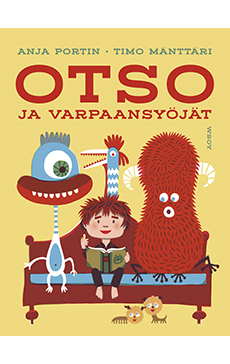 Otso starts imagining ever more fearsome man-eating creatures. Maybe they’ve got really slimy bellybuttons? Or lots – and I mean LOTS – of teeth? This rollicking story contains plenty of cheeky fun for young children! Little ones’ fears and quirky preoccupations are handled with an appropriately warm touch.